Keep up to date with all the latest news from WordStream, including product updates, business developments, and more. April 2, 2019 - WordStream releases WordStream Advisor for Ecommerce to streamline retail advertising campaigns. January 15, 2019 - The company joins 230 area businesses in the Boston Women's Workforce Council initiative. August 16, 2018 - Inc. recognized WordStream as one of the fastest-growing private companies in the U.S. for the sixth year running. July 18, 2018 - The Content Marketing Institute named the WordStream blog the Best Topic-Specific Blog in their 2018 awards. June 22, 2018 - The Boston Business Journal ranked WordStream as #19 in the top 20 medium-sized companies to work for in Boston. February 6, 2018 - WordStream has announced the winner of its second “Grade and Get Paid” competition. January 10, 2018 - WordStream announced this week that it has promoted Howard Kogan, appointed President of the company in June of 2017, to the position of Chief Executive Officer effective immediately. November 17, 2017 - WordStream was named one of the Top Places to Work in Massachusetts in the 10th annual employee-based survey project from the Boston Globe. August 17, 2017 - WordStream, Inc. has been named to Inc. Magazine’s annual ranking of the fastest-growing private companies in the U.S. for the fifth consecutive year. June 23, 2017 - WordStream Inc. was honored as one of Boston’s top 20 best places to work by the Boston Business Journal for the third year in a row. May 22, 2017 - WordStream has tapped former C Space President and COO Howard Kogan to step into the new role of President. May 9, 2017 - WordStream Inc., a leading provider of online advertising software and services, has acquired Algorithmic Ads, a software provider that helps businesses quickly generate effective display ads based on their existing website imagery. Feb. 3, 2017 - During 2016, WordStream surpassed 200 employees and moved into a larger office space at 101 Huntington Avenue to accommodate current and future expansion. Jan. 31, 2017 - WordStream Advisor for Agencies makes cross-platform portfolio management a cinch. Jan. 24, 2017 - WordStream has revamped its flagship offering, WordStream Advisor, to make advertising even easier for businesses of all sizes. November 28, 2016 - WordStream has been awarded the 2016 North America Google Channel Sales New Accounts Champion Award for the highest percentage of new account growth among Google’s North American partners. November 15, 2016 - Microsoft today named WordStream as one of a select group of top performing partners to act as trusted advisors to Microsoft’s growing customer base for search advertising opportunities through the Bing Ads Network. September 19, 2016 - WordStream, Inc. today announced the release of the updated AdWords Performance Grader, the award-winning free tool that provides users with a comprehensive report on the effectiveness of their Google AdWords PPC account, now with more mobile features. August 17, 2016 - WordStream Inc., a provider of digital marketing software and services, was named today to Inc. Magazine’s 35th Annual Inc. 5000, a ranking of the fastest-growing private companies in the U.S.
June 24, 2016 - WordStream, Inc. was honored as one of Boston’s top 11 best places to work by the Boston Business Journal for the second year in a row. June 21, 2016 - WordStream Inc., a provider of online advertising software and services, has introduced a new free social advertising tool, the Facebook Advertising Opportunity Calculator, which is designed to help small businesses see how many people really see their organic Facebook posts as well as calculate the potential impact to their business of Facebook Advertising. June 7, 2016 - WordStream, Inc., a provider of online marketing software and services, was named the winner in the category of Best Content Marketing at the 20th annual MITX Awards in June. April 28, 2016 - The Boston Business Journal recently recognized WordStream, Inc., a provider of online advertising products and services, as one of the fastest-growing companies in Massachusetts and the Greater Boston metropolitan area as part of the publication’s Fast 50 awards. January 13, 2016 - WordStream announced a new standalone product that makes Facebook advertising more effective, more cost-efficient, and less complicated for businesses of all types and sizes, especially those with limited time, budgets, marketing resources, or depth of knowledge in social advertising. December 14, 2015 – WordStream Inc., a provider of online advertising software and services, was honored by Google this month with two awards, including the PSP Innovator Award, Google’s annual recognition of a Premier SMB Partner (PSP) who demonstrates outstanding innovation in technology and solutions. October 27, 2015 – WordStream Inc., a provider of online advertising software and services, closed Q3 with high distinction, having won three industry awards and earning top marks in the recent G2 Crowd Grid report for search advertising. October 6, 2015 - WordStream Inc., a provider of online advertising software and services, today introduced its latest software offering, designed to help small businesses capitalize on the huge potential of Facebook advertising. Sept. 15, 2015 – WordStream Inc., a provider of search marketing software and PPC management solutions, is pleased to announce it is the winner of the first Google Channel Sales Platform Innovator Award, in recognition of WordStream’s commitment to creating technology that empowers businesses to be more successful with online advertising. Aug. 18, 2015 – WordStream Inc. was named No. 567 on Inc. Magazine’s 34th annual Inc. 5000, an exclusive ranking of the nation's fastest-growing private companies. July 8, 2015 – WordStream, Inc., a provider of search engine marketing software and services, was named one of Boston’s best places to work in the Boston Business Journal’s annual Best Places to Work awards. June 30, 2015 – WordStream Inc. and Constant Contact Inc. (NASDAQ: CTCT)—both best-in-class digital marketing companies based in the Boston area—have partnered to help small businesses find new customers and grow long-lasting customer relationships through a combination of paid search and email marketing. Feb. 19, 2015 – WordStream, Inc., a provider of search engine marketing software and services, was recently named a Google AdWords Premier SMB Partner, joining a group of highly-qualified companies. Dec. 18, 2014 – WordStream, Inc., a provider of search engine marketing software and services, today announced the launch of its latest software tool, the Bing Ads Performance Grader. Aug. 21, 2014 – Boston-based WordStream Inc. was named this week to the Inc. 5000, Inc. Magazine’s annual list of America’s fastest-growing companies. July 29, 2014 – WordStream today announced the launch of PPC University, a completely free learning resource that aims to take the headaches out of learning about pay-per-click advertising for those new to internet marketing. July 8, 2014 – WordStream has secured $12 million in new funding, led by new investor Baird Capital of Chicago, the direct private investment arm of Robert W. Baird & Co., with participation by current investor Sigma Partners. June 24, 2014 – WordStream announced the launch of Call Tracking, a new feature that enables paid search advertisers to track and measure which ads and keywords are driving call-in leads and sales. March 3, 2014 – WordStream Inc. today announced the launch of its latest free software tool, the AdWords Landing Page Grader. 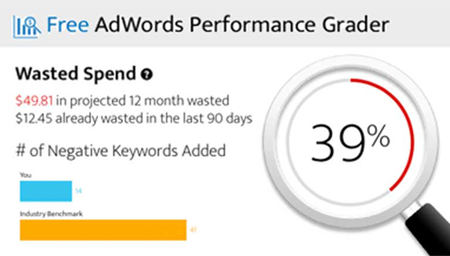 Jan. 7, 2014 – WordStream announced a new version of its AdWords Performance Grader, an award-winning free tool that gives users an instant report on their Google AdWords PPC account, including performance ratings in nine key areas, a best practices check, and actionable tips for improvement. October 9, 2013 – According to new research unveiled today by WordStream, Inc., small businesses are wasting nearly 25% of their pay-per-click (PPC) marketing spend due to simple managerial and strategic errors. September 10, 2013 – WordStream Inc. released a new version of its PPC management platform, WordStream Advisor, now with support for the creation and management of PPC landing pages. August 21, 2013 – WordStream Inc. came in at #185 on Inc.’s list of the 5,000 fastest growing private companies in the US for 2013, a recognition of its rapid and ongoing growth in the past several years. May 31, 2013 – WordStream released a new reporting feature as part of its WordStream Advisor software: the PPC Success Report. The PPC Success Report creates a beautiful and comprehensive visual analysis of a user’s account performance at the click of a button. May 29, 2013 – WordStream has experienced record growth in the past year and is positioning itself for further expansion with the addition of a new member to its board of directors. July 26, 2012 – WordStream Inc., a provider of search engine marketing software and services for small and medium-sized businesses, recently secured an additional $6 million in third-round financing, led by Sigma + Partners as well as Egan-Managed Capital, both previous investors in the company. The company has raised a total of $16M to date. July 24, 2012 – WordStream has announced a new release of WordStream Advisor, now with support for Microsoft adCenter. Users of WordStream Advisor can now seamlessly manage their pay-per-click marketing campaigns across the Web (Google AdWords, Bing and Yahoo! Search) in one powerful, easy-to-use PPC management platform. June 15, 2012 — WordStream Inc. has been selected as a winner at the 2012 MITX Innovation Awards in the category of Best Customer Engagement Driver for the AdWords Performance Grader, a free pay per click (PPC) audit tool. May 15, 2012 – With Facebook’s initial public offering (IPO) just around the corner, many are wondering if the company can live up to its enormous valuation of approximately $100 billion. Accordingly, WordStream Inc. has released new research comparing the value of Facebook advertising to Google’s Display Network. Who comes out on top? April 25, 2012 – The Internet marketing industry is a vast sea of companies of all different sizes, operating in areas from email marketing to crowdsourcing to search engine optimization. It’s virtually impossible to operate a business in 2012 without engaging in Internet marketing, and it’s very easy to get lost in this sea of providers. To help end users and businesses navigate the Internet marketing landscape, WordStream Inc. has created a map of the top web marketing companies. January 23, 2012 – WordStream today released an infographic that details the top 10 industries that spent the most on Google AdWords advertising in 2011. This data comes on the heels of Google’s 2011 earnings call last week and reveals which industries contributed most to Google’s $37.9 billion in revenues, 96% of which came from advertising. Nov. 16, 2011 – WordStream Inc. today released an infographic that demystifies the Google AdWords bidding process. AdWords, the most popular pay-per-click (PPC) advertising platform, is a complicated system, but it functions very similarly to an auction. WordStream leverages the familiar auction metaphor to make key AdWords concepts clear. Nov. 1, 2011 – WordStream Inc. today announced its free AdWords Performance Grader service has been used thousands of times to grade over $180M of collective paid search spending. Reviewing anonymized results, the company also gained insight into common AdWords mistakes around account activity, negative keywords, and landing pages. Oct 17, 2011 – Following Facebook’s release of an iPad app last week – an app that has drawn a "too little, too late" response from critics so far – WordStream Inc. released a “Facebook Wall of Shame” infographic detailing Facebook’s criticisms, missteps and outright failures over the seven years since its inception. Oct 13, 2011 – WordStream Inc. today announced the release of its new Pause Keywords Tool, a unique notification system that automatically analyzes a user’s AdWords account on a weekly basis to find hidden keywords that are negatively impacting performance and profitability. September 26, 2011 – WordStream Inc., a provider of search marketing software and services, has teamed up with inbound marketing platform provider HubSpot to offer the AdWords Performance Grader in the HubSpot App Marketplace. July 18, 2011 – WordStream Inc. unveiled new keyword research data that reveals the top 20 high-volume keyword categories that fetch the highest costs per click in Google AdWords pay-per-click advertising, or PPC. Following up on Google's recent announcement of its Q2 earnings, these high-CPC keywords reveal where Google is making the majority of its profits. June 27, 2011 – WordStream Inc., a provider of search marketing software and services, has moved to the next level of maturity as a company, with a complete and seasoned leadership team in place. April 18, 2011 – WordStream Inc. announced the release of its new Keyword Research Suite, a comprehensive suite of tools designed to help marketers find and organize large numbers of targeted keywords for use in paid and organic search campaigns. January 6, 2011 – WordStream announced the release of a new suite of AdWords Campaign Management Tools designed to help anyone who uses Google AdWords build top-performing pay-per-click campaigns and discover new, profitable keyword opportunities. August 12, 2010 - WordStream, Inc. today announced Ralph Folz, formerly COO of Isobar and founder of Molecular, as the company's new CEO. June 22, 2010 – WordStream, Inc. today launched The Free Negative Keyword Tool, which is designed to quickly identify lists of highly-effective negative keywords for PPC advertisers. June 17, 2010 – WordStream, Inc., a provider of Internet marketing software for search engine optimization and pay per click advertising, today announced that it has been chosen by AlwaysOn as one of the AlwaysOn East Top 100 Private Companies. May 10, 2010 – WordStream has secured $6 million in series B financing from Egan-Managed Capital. The company will use the funding for continued growth and expansion of its search marketing tools for search engine optimization (SEO) and pay-per-click (PPC) advertising. December 16, 2009 – WordStream, Inc., a provider of keyword tools for PPC and SEO, today launched a pair of tools designed to help businesses identify and optimize highly profitable keyword niches. November 10, 2009 – WordStream, Inc., today announced the release of two new features in their flagship keyword management solution that represent exciting industry firsts for search marketers. October 28, 2009 – WordStream, Inc., a provider of search marketing tools for continuously optimizing and expanding PPC and SEO efforts involving large numbers of keywords, announced today that Ralph J. Folz has joined the WordStream Board of Directors. September 16, 2009 — WordStream today launched The Free Keyword Tool for pay-per-click (PPC) advertising and search engine optimization (SEO) programs. Beta testers say it is more comprehensive and accurate than paid subscription versions of Keyword Discovery and Wordtracker. June 17, 2009 — WordStream has been selected as a “Promise Award” winner in the category of “Online Advertising” for the 2009 MITX Technology Awards. May 12, 2009 — WordStream, Inc., a leading provider of keyword management solutions, announced today that it has been named as a finalist for the 6th Annual MITX Technology Awards. January 28, 2009 — All-New Keyword Tool Simplifies and Automates Time Consuming, Repetitive Tasks Required to Create and Manage Highly Effective Search Marketing Campaigns. December 24, 2008 — Learn more about the release of a new white paper offering tips, tricks, and search engine marketing best practices sure help you improve your business's search-related return on investment.